Native to southern Africa (i.e. Cape Province in South Africa). Boneseed (Chrysanthemoides monilifera subsp. monilifera) was deliberately cultivated as a beach and sand stabiliser, and also as a garden ornamental, in the past. Boneseed (Chrysanthemoides monilifera subsp. monilifera) occurs mainly in the coastal and sub-coastal regions of southern Australia. It is most common in the coastal regions of south-eastern Australia (i.e. in central and southern New South Wales, southern Victoria, Tasmania and south-eastern South Australia) and relatively common in the coastal regions of south-western and western Western Australia. It also has a scattered distribution in the sub-coastal and inland parts of Victoria, South Australia, south-western Western Australia and south-western New South Wales. Also naturalised overseas in New Zealand. Originally introduced to prevent soil erosion in coastal and inland areas, it is most prevalent on sand dunes and in other coastal environments. It is widespread in the coastal and sub-coastal areas of the cooler temperate regions of Australia, and is also found in semi-arid environments. In these areas it also invades open woodlands, forests, waste areas, roadsides, waterways (i.e. riparian areas) and pastures. An upright (i.e. 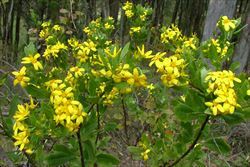 erect) or spreading shrub (usually 1-3 m tall and 1-3 m wide), that may occasionally develop into a small tree reaching up to 6 m in height. an upright and slightly fleshy shrub, often found growing in coastal areas. it has white woolly young growth and coarsely toothed leaves. its yellow 'daisy-like' flower-heads usually have only five to eight 'petals'. its fleshy fruit (6-9 mm across) turn blackish in colour as they mature and contain a single seed. these seeds are are bone-coloured or light brown (6-8 mm in size) and have a smooth surface texture. 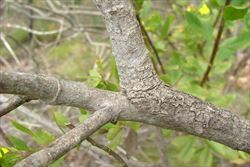 The stems are much-branched, green or often purplish-green when young, and become woody with age. 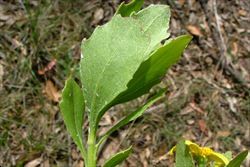 The leaves are alternately arranged, with stalks (i.e. petioles) 8-25 mm long, and tend to be slightly fleshy (i.e. semi-succulent) in nature. New leaves often have a covering of dense white cottony down, while older leaves are mostly hairless (i.e. glabrous). The leaf blades (2-9 cm long and 1.5-5 cm wide) vary from being oval (i.e. elliptic) to egg-shaped in outline (i.e. obovate) to sometimes nearly spoon-shaped (i.e. broadly spathulate). They are very coarsely toothed (i.e. serrate) and have pointed tips (i.e. acute apices). The flower-heads (i.e. 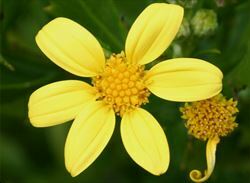 capitula) are daisy-like with bright yellow 'petals' (i.e. ray florets) 8-13 mm long. These flower-heads (15-30 mm across) are borne in small clusters at the tips of the branches (i.e. in terminal panciles) and usually have only five to eight 'petals' (i.e. ray florets). Flowering occurs throughout the year, though mostly during the cooler late autumn and winter months. The fleshy fruit (6-9 mm across) are green when young but as they mature their skins turn blackish in colour. This outer covering later flakes off, revealing a hard white inner surface. 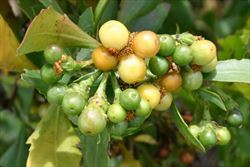 Each fruit contains a single, hard seed. The seeds (6-8 mm in size) are whitish, bone-coloured or light brown, almost round (i.e. globose), and have a smooth surface texture. Boneseed (Chrysanthemoides monilifera subsp. monilifera) reproduces mainly by seed, which are readily eaten and dispersed by birds. Seeds may also be spread by water, machinery, other animals (e.g. foxes, rabbits and ants), in contaminated soil, and in dumped garden waste. Boneseed (Chrysanthemoides monilifera subsp. monilifera) is a significant environmental weed in Victoria, South Australia, New South Wales and Western Australia and is also regarded as an environmental weed in Tasmania. It is of such concern that it has been listed among the twenty Weeds of National Significance (WoNS) and it is actively managed by community groups in several states (e.g. Tasmania, South Australia and Victoria). It is a significant problem because of its ability to establish in disturbed and undisturbed native vegetation ranging from mallee scrub to open eucalypt forests, littoral rainforest communities, and, in particular, coastal habitats (e.g. heathlands and sand dunes). It can form dense thickets several metres high which exclude most native understorey species and prevent their regeneration. In such situations the native fauna may also be affected by the loss habitat and food sources. This aggressive species has spread rapidly and is replacing entire ecosystems and invading conservation areas in southern Australia. 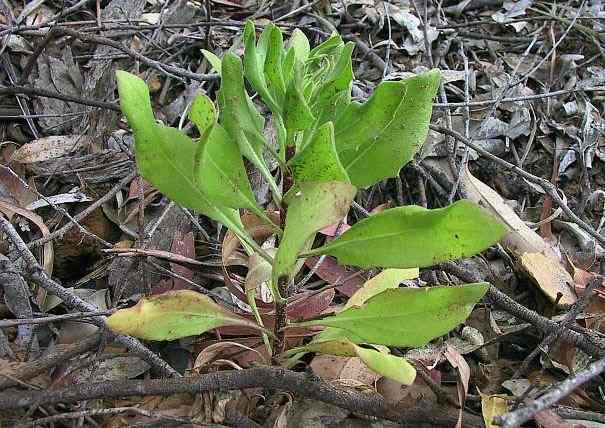 Its weediness is largely due to its vigorous growth and its ability to regenerate quickly and outcompete other species after fire. 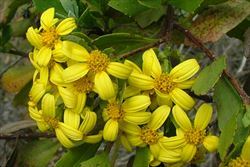 The spread of boneseed (Chrysanthemoides monilifera subsp. monilifera) already threatens a number of rare or threatened species, such as the brittle greenhood orchid (Pterostylis truncata) in Victoria. 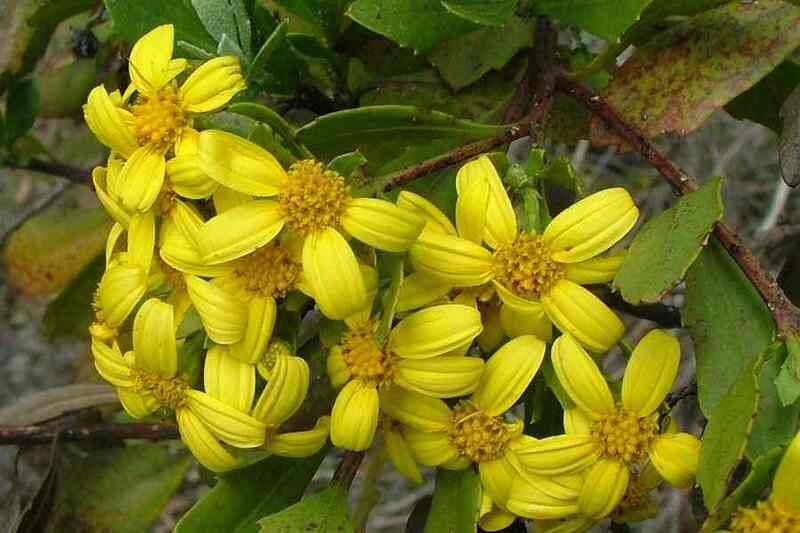 The invasion of native plant communities by bitou bush Chrysanthemoides monilifera subsp. rotundata) and boneseed (Chrysanthemoides monilifera subsp. 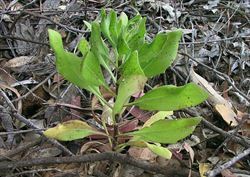 monilifera) has been declared as a "key threatening process" in New South Wales, and has been identified as a threat to the survival of a number of plant species and communities in this state. Boneseed (Chrysanthemoides monilifera subsp. 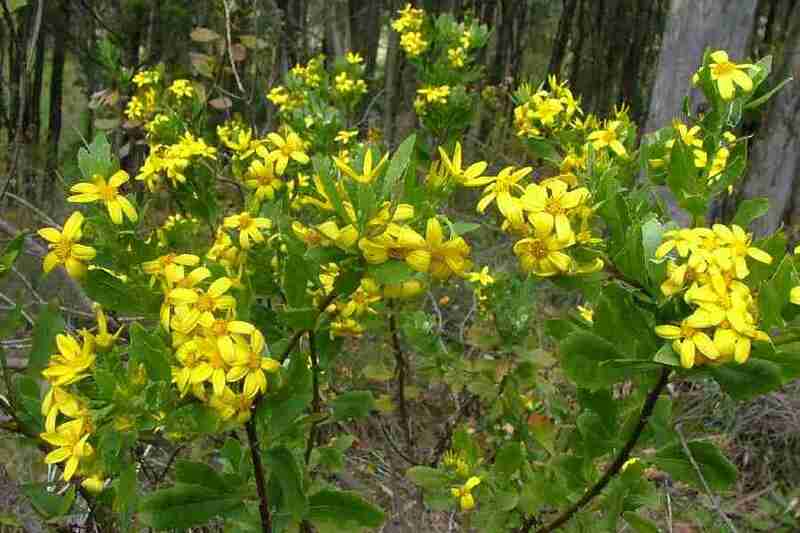 monilifera) is surprisingly flammable for an evergreen plant and dense thickets can be a significant fire hazard. New South Wales: Class 2 - a regionally prohibited weed. 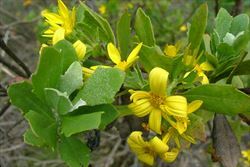 The presence of the weed must be notified to the local control authority and it must be eradicated from the land and the land must be kept free of the plant (on Lord Howe Island only), Class 3 - a regionally controlled weed. The relevant local control authority must be promptly notified of the presence of this weed and it must be fully and continuously suppressed and destroyed (in a large number of local authority areas), and Class 4 - a locally controlled weed. The growth and spread of this species must be controlled according to the measures specified in a management plan published by the local control authority and the plant may not be sold, propagated or knowingly distributed (in a large number of coastal local authority areas). See the New South Wales Department of Primary Industries Noxious Weeds List at http://www.dpi.nsw.gov.au for more detailed information on which local areas are covered in these declarations. South Australia: Class 4@ - control of this weed must be undertaken throughout the entire state (trade and movement are also usually restricted throughout the state). Victoria: P4 - prohibited and must be eradicated or controlled (in the Mallee, North Central, West Gippsland and East Gippsland regions), and C6 - all reasonable steps must be taken to control the weed and prevent its spread (in the Wimmera, Glenelg, Corangamite, Port Phillip East, Port Phillip West and Goulburn regions). the National Weeds Strategy Strategic Plan for boneseed, which is available online at http://www.weeds.org.au/docs/bbbstrat.pdf. 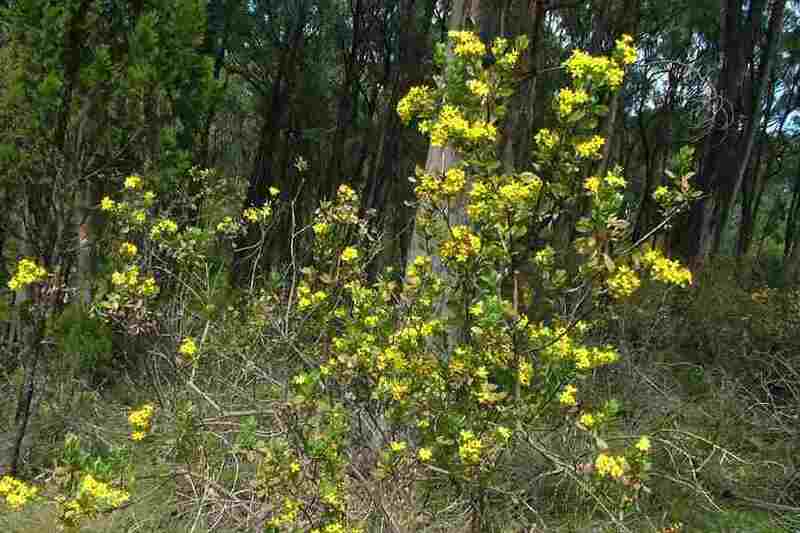 the Victorian Department of Sustainability and Environment Landcare Note on boneseed and bitou bush, which is available online at http://www.dse.vic.gov.au. 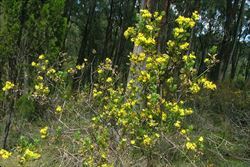 the Western Australian Department of Agriculture and Food information page on boneseed and bitou bush, which is available online at http://www.agric.wa.gov.au. 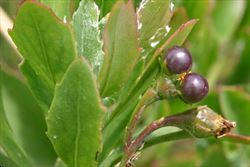 the Tasmanian Department of Primary Industries and Water Weed Service Sheet on boneseed, which is available online at http://www.dpiw.tas.gov.au. boneseed (Chrysanthemoides monilifera subsp. monilifera) is a more upright plant with oval or almost rounded (i.e. elliptic or sub-orbicular) leaves that have coarsely toothed (i.e. serrate) margins. Its flower-heads (i.e. capitula) commonly have only five to eight 'petals' (i.e. ray florets) and its seeds are bone-coloured or light brown, almost round, and have a smooth surface texture. bitou bush (Chrysanthemoides monilifera subsp. rotundata) is a low-growing, spreading plant with somewhat spoon-shaped (i.e. obovate or broadly spatulate) leaves that have entire or slightly toothed margins. Its flower-heads (i.e. capitula) usually have more than ten 'petals' (i.e. ray florets) and its seeds are dark brown or blackish in colour, oval or egg-shaped, and have a ribbed surface texture. Several of the native boobialla shrubs (e.g. Myoporum insulare and Myoporum boninense) may be confused with boneseed (Chrysanthemoides monilifera subsp. monilifera) because they have similar leaves and fruit. However, the boobiallas (Myoporum spp.) have small whitish flowers that are tubular in shape with five petal lobes, and their fruit are also usually purple in colour rather than black. There are also some other yellow-flowered weeds from the 'daisy' family (i.e. Asteraceae) that may look similar from a distance. 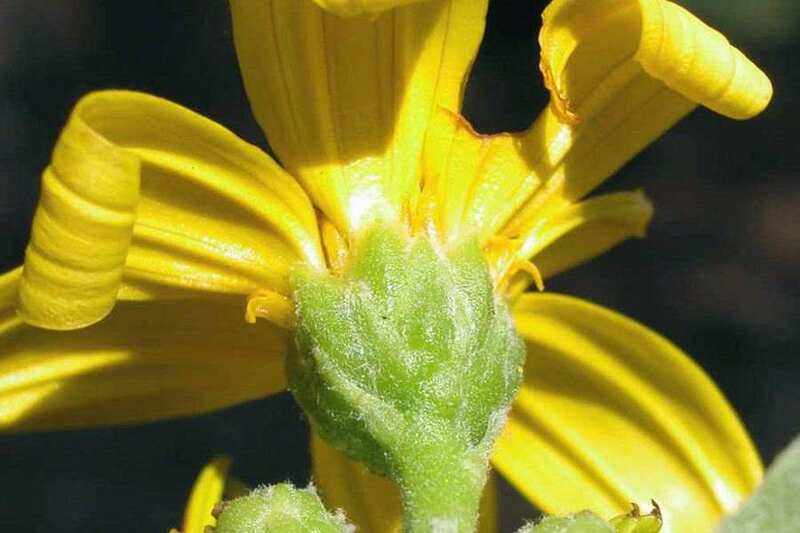 Ragwort (Senecio jacobaea), South African daisy (Senecio pterophorus) and fireweed (Senecio madagascariensis) have some similarity, as they also produce many showy, yellow, daisy-like flowers. However, these species are much smaller in stature with relatively narrow or deeply divided (i.e. dissected) leaves. Japanese sunflower (Tithonia diversifolia) is also slightly similar and can have a shrubby appearance. However, it can be distinguished by its larger flower-heads (usually greater than 10 cm diameter) and three-lobed leaves.